LONDON, England (CNN) -- Now it is political. With the public holding their noses as they pass the British Parliament, so tainted has it become by the shameless exploitation of a sloppily-policed expenses system by elected representatives from all quarters, it has become a competition between the parties as to who can most deftly extricate themselves from the mire. 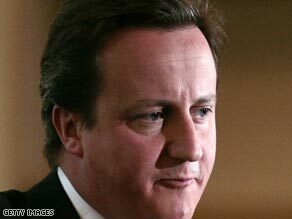 David Cameron, the leader of the opposition Conservative party, has seized the upperhand. So far it has to be said that David Cameron, the leader of the opposition Conservatives and the opinion poll favorite to win the next general election, is making the better job of it. He was quicker than Prime Minister Gordon Brown, the leader of the Labour Party, to apologize for the excesses committed by MPs in all parties. He best reached the man in the street with his comment: "Politicians have done things that were unethical and wrong. I don't care if they were within the rules. They were wrong." So MIchael Gove, a close aide and his party's education spokesman, is to pay back more than $10,000 taken for buying furniture for a second home. Andrew Lansley will repay $3,000 for similar expenditure and Alan Duncan, the millionaire shadow leader of the Commons, will hand back more than $7,500 taken for the upkeep of his garden. Cameron himself is paying back over $1,000 claimed for removing wisteria creeper from his chimney and repairing a conservatory roof. What do you think about the expense scandal? Several ministers in Brown's government have announced their own plans to return money to the taxpayer. Health Minister Phil Hope will give back $60,000 taken for his second home over seven years and Communities Minister Hazel Blears is to return the $20,000 plus she saved in capital gains tax on selling a London flat by telling the tax authorities it was her (non-taxable) main home while she had been claiming Parliamentary allowances for it as a second home. The Conservatives are imposing a ban on 'flipping' -- the practice of redesignating different properties owned by MPs as their official 'second home' so that each in turn can be refurbished at the taxpayer's expense. The Liberal Democrats want a ban on parliamentarians making any profit on the sale of properties which have been spruced up at the public expense. Wednesday's Prime Minister's Question session was dominated by the expenses issue with Brown admitting that the public could not be expected to trust legislators again until they had a transparent and fair expenses system established. They must, he said, remove the errors in the system and apologize to electors. With local government and European Parliament elections coming up, Cameron argued that the milking of the system that had gone on was not just a legal question but a moral and ethical one which required political leadership. He also introduced a new element, calling for the scrapping of the "communications allowance" under which MPs are allotted up to $15,000 a year to set up Web sites etc telling the electors what a good job they have been doing. That was, he insisted, a 'gigantic waste' of public money. Britain's MPs are now painfully conscious of the deep harm that has been done to the whole political process by the expenses scandal. It is one thing to have the citizens in pubs and cafes complaining about the inadequacy of governments and parliamentarians in tackling the country's problems. It is quite another for them to experience the total contempt of the public for legislators who at a time of economic stringency for others have been indulging in a corrupt expenses culture which has insulated them from the problems of ordinary people. It is not just the scale of the expenses scams: the chandelier installations, the swimming pool cleaning and the clearing of moats around grand country houses at public expense which has horrified people -- it is the sheer pettiness of MPs who claim for pots of yogurt, oven gloves or garden manure. Even worse, for many, was the spectacle of the Speaker, the man elected by MPs to ensure their proceedings are properly and honestly conducted, getting far angrier about the reporting of the issue than the scams themselves, and shouting down MPs who had dared to talk to the media about it. What nobody spelled out at Prime Minister's Question Time but what many were wondering was: if political leaders are now admitting that MPs can't even be trusted to run their own expenses system without outside supervision, then how can they be left free to run the country without someone else looking over their shoulder?